We all know gardening is good for you. Whether it’s millenials growing succulents in geometric patterned pots, or retirees ploughing away at their allotments, the appeal of gardening is timeless and ageless. A 2017 paper titled ‘Gardening is beneficial for health: A meta-analysis’ noted a positive association between gardening and depression/anxiety, stress, mood disturbance, BMI, as well as increases in quality of life, sense of community, physical activity levels, and cognitive function. And there’s nothing quite like getting to eat what you garden. As I make my way through this year’s harvest, I get a thrill every time I dig into a salad made with my own home-grown veg or bite into a juicy, plump grape from my vine. 1. You eat more fruit and veg! How can you not, when you’ve put in the work to get it to grow in the first place? 2. Eat fresh: say goodbye to those mushy bags of supermarket leaves and hello to freshly picked, crunchy salad. 3. You know what’s in your food. You get to make it organic and fancy without the price tag. Here’s a step by step guide to get you started. You don’t even need a garden for these babies to grow. Just some soil (click the Amazon link below – see, we’ve thought of everything) and something to grow it in. Just recycle what you have: egg boxes make nice seed trays or use a yogurt pot with a hole or two in the bottom for drainage. Put them on a plate or tray so that your kitchen doesn’t turn into a muddy mess and let’s begin! 1. Salad leaves: sow seeds in a pot filled with soil, water and remove the weakest sprouts when the seedlings start to appear a few days later. This will make space for the strong ones to grow. As your pot fills with leaves, you simply snip at the base and add to your salad! Leave the roots in tact to you can keep getting more crop from the plants. 2. Radish: sow as above a month after the frosts have passed and you can keep sowing throughout the summer. Harvest your crop every month and enjoy! You’ll need deeper tubs than an egg box for these. 3. Potatoes: now there’s fancy ways to do things, and then there’s the cheat way. Here’s mine. Those old potatoes that are sprouting in the kitchen that you keep meaning to cook? Chuck them in an opaque, deep bag - there are actually things called potato bags for this - but an old (empty!) rice sack will be fine. Half fill the sack with compost and throw your potatoes in. You’ll see some shoots appear after a while. Keep covering the shoots with more soil to cover them and keep going until the bag’s full. Don’t forget to water them J Then once the foliage has all withered and died (about 10-20 weeks later), dig in (literally) to harvest your crop! Sow in late Feb/March and harvest July/Sept. Currently, we’re teaming up with design duo PaperchainG and running our Instagram giveaway. 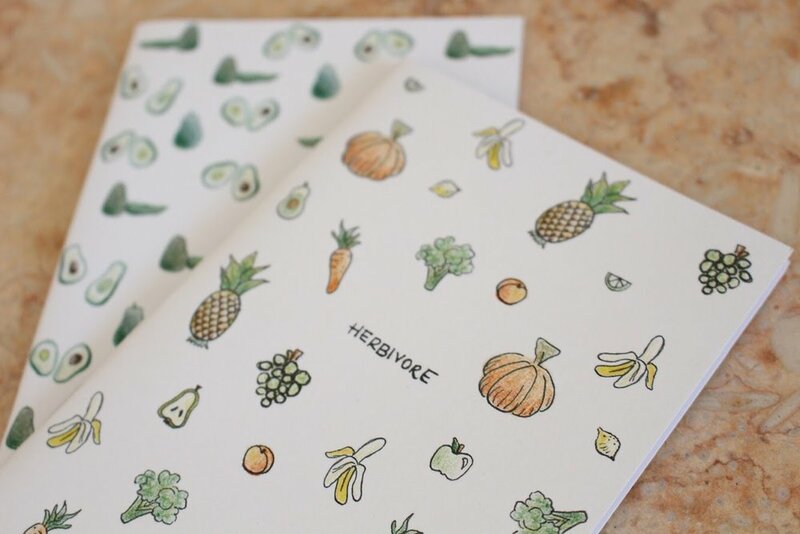 Check it out and be in a with a chance to win a gorgeous ‘Herbivore’ notebook from their stunning collection. In the mean time, enter HAPPYWISEWELL to get an exclusive 25% their entire range at their online Etsy store.